A 6-part drama series about a UK CEO who is sent out by his secretive London Board to head up a debt-ridden Australian mining firm and who — with the help of a hastily-formed Aussie crisis-management team — is under ruthless instruction to either save the company or dump it. 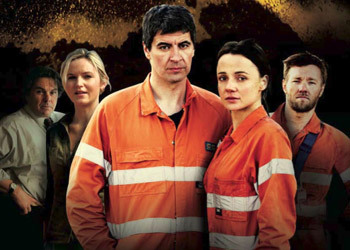 A series about one of Australia's oldest and riskiest pursuits; about the men and women who work deep underground, or on a heaving platform at sea, or drive huge trucks inside gaping pits in burning heat so that everyone else can watch TV, or use the phone, or open the fridge. The men and women — from the faction-torn board, down to the hazardous ore face — striving to save a proud if crippled Australian firm that is about to collapse unless a UK oil-executive, an Aussie geologist and an ill-matched crisis management team can somehow save it.